Summary: Obama journeys to Alaska and says things. Our journalist-stenographers reprint this as news. They do not consult local experts, and so miss an important part of the story. This post gives you the rest of the news. The great oddity of the climate change campaign is the disinterest of journalists in reporting it well. Stories about our certain doom often omit vital context (e.g., burning off the world’s fossil fuels means the 21st century relies on coal for energy, like the 19thC), forget to mention the IPCC when it disagrees with alarmists (e.g., about the danger of a methane apocalypse), and ignore the host of research facilities studying relevant aspects of our changing world. We see that last factor at work in journalists’ reporting about Obama’s climate campaign tour of Alaska. Google News shows no stories in the mainstream news mentioning the findings of the Alaska Climate Research Center. I have posted their work in response to previous panicky stories about Alaska melting in 2009, in 2013, and again here. 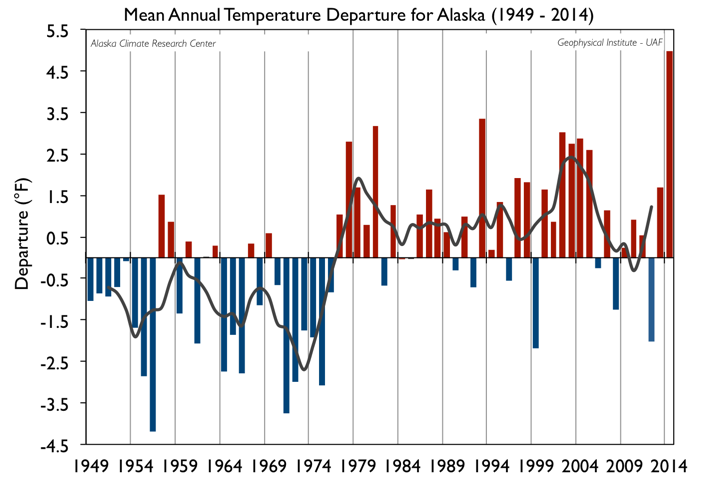 Here is their Temperature Changes in Alaska page (updated annually; red emphasis added). It’s quite clear. “This page features the trends in mean annual and seasonal temperatures for Alaska’s first-order observing stations since 1949, the time period for which the most reliable meteorological data are available. The temperature change varies from one climatic zone to another as well as for different seasons. If a linear trend is taken through mean annual temperatures, the average change over the last 6 decades is 3.0°F. “… Considering just a linear trend can mask some important variability characteristics in the time series. The figure at right shows clearly that this trend is non-linear: a linear trend might have been expected from the fairly steady observed increase of CO2 during this time period. The figure shows the temperature departure from the long-term mean (1949-2009) for all stations. It can be seen that there are large variations from year to year and the 5-year moving average demonstrates large increase in 1976. 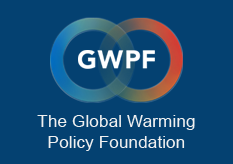 “During the first decade of the 21st century most of Alaska experienced a cooling shift, modifying the long-term warming trend, which has been about twice the global change up to this time. All of Alaska cooled with the exception of Northern Regions. This trend was caused by a change in sign of the Pacific Decadal Oscillation (PDO), which became dominantly negative, weakening the Aleutian Low. This weakening results in less relatively warm air being advected from the Northern Pacific.